It is hard to locate when President Trump first declared war on the government establishment, but the story may well begin on the night of January 30th. Three days earlier, Trump, prodded by his most ideological aides, had issued an executive order banning travellers from seven Muslim-majority countries. On the 30th, Sally Yates, the acting U.S. Attorney General, refused to defend the order, saying that she was not convinced that it was lawful. Trump reacted with a fury not seen in the White House since the Nixon era. Yates had been working in her office at the Department of Justice, several blocks away. A twenty-seven-year veteran of the department, she knew that she would not occupy the office long. Jeff Sessions, a Republican senator from Alabama, was Trump’s choice to be Attorney General, and although he was likely to face some tough questioning from the Senate Judiciary Committee, he was also almost certain to win confirmation. Sally Quillian Yates, who is fifty-six, spent more than two decades as a federal prosecutor in Georgia before being named a U.S. Attorney and then the Deputy Attorney General by President Obama. She and her husband, Comer, live in Atlanta, but she keeps a modest apartment in Washington, where I met her for her first interview since her career at the Department of Justice ended. Yates was composed, disciplined, and sharp-witted as she spoke about her brief time in the Trump Administration, but she showed more emotion when we came to the moment of her firing. Yates faced nine senators, eight of them men, who at times lectured her about her responsibilities. “Are you familiar with 8 U.S.C. Section 1182?” Senator Ted Cruz asked. “Not off the top of my head, no,” Yates replied. Cruz read a portion of the law, which vested the President with the authority to “suspend the entry of all aliens or any class of aliens as immigrants,” and gave a self-satisfied grin. “I am familiar with that,” Yates told Cruz. “And I’m also familiar with an additional provision of the I.N.A.”—the Immigration and Nationality Act—“that says no person shall receive preference or be discriminated against an issuance of a visa because of race, nationality, or place of birth, that I believe was promulgated after the statute that you just quoted.” She added that, beyond the text of the statute, she had to judge whether Trump’s executive order was in violation of the Constitution. The video clip of Yates’s retort became a social-media sensation. During the subsequent round of questioning, Cruz was conspicuously absent. Before her firing, few people had heard of Sally Yates, but she became a hero to the Trump opposition. Hundreds of people sent her letters of thanks, which are stacked in her home in Atlanta. “ ‘Humbling’ is the only word I can think of,” she said. “I’ve never been generous enough to write somebody else a letter who did something that didn’t personally involve me.” After her Senate appearance, many young women—and plenty of men—made Yates their social-media avatar, as Yates’s twenty-five-year-old daughter proudly informed her. Yates’s paternal grandmother, Tabitha Quillian, was one of the first women to be admitted to the Georgia bar, in 1934. She had studied under a lawyer, without telling her husband. According to family lore, he learned about it when he found her name in the newspaper one morning. Yates told me, “My grandfather turned to her and said, ‘Look at that! There’s another Tabitha Quillian who passed the bar.’ ” At that time in the South, it was unheard of for women to practice law, so she worked as her husband’s legal secretary and then played a similar role for her two sons. Yates was impressed by her willingness to speak out. “Mama, as we called her, was not one to hold back her opinion on things,” she said. Yates’s mother, Xara Terrell, was also a Georgia native and the daughter of a lawyer. She and Kelley Quillian had two daughters, Sally and her sister, Terre, who is now a conservative talk-radio host in Birmingham, Alabama. Yates went to college at the University of Georgia, where she studied journalism. “When I graduated from college, my thought was: I don’t want to be a lawyer. I don’t want to marry a lawyer. And I don’t even really want a lot of lawyer friends,” she said. “I am a lawyer. I married a lawyer. And I’ve got a lot of lawyer friends. So much for knowing what you’re going to do.” Thinking that she might want to work on Capitol Hill, she spent a summer in Washington as an intern for Senator Sam Nunn, a Democrat from Georgia. After college, she moved to Washington and worked as a staff assistant for Representative Jack Brinkley, a conservative Democrat, also from Georgia. The experience helped change her mind about studying law. “I loved the process of being in the center, where it felt like the important decisions are being made about our country,” she said. Yates did not find her work at King & Spalding especially satisfying; she described most of it as “two companies fighting over money.” Bell, knowing that she was “itching for a cause,” found a pro-bono case for her. The client was Lovie Morrison Jones, an African-American woman in her nineties. Decades before, Jones had inherited ninety-two acres in rural Barrow County, Georgia, from her family, who were among the first black landowners in the area. Because Jones distrusted the courts, she never filed the deed, and kept it tucked in her shirt as she tilled the land. In the early eighties, she learned that several acres, mostly swampland, had been sold without her knowledge, and that a developer planned to build a subdivision there. Yates found a woman, Ruth Chancey, who had seen Jones working the disputed piece of land. But Chancey was from a moonshining family that was part of the Dixie Mafia, a criminal organization in the South, and she wasn’t eager to testify. “Her son had been convicted for murder,” Yates said. “My recollection is that he killed a man and dropped him into a well, so Chancey didn’t have a lot of warm feelings for the court system.” But Chancey finally agreed, and she helped convince the jury that the land belonged to Jones. Soon afterward, Yates had dinner with friends who had worked in the U.S. Attorney’s office, and she realized, she said, that, with the exception of Jones’s case, “I didn’t have the sense of purpose behind my practice there that they were describing.” She sought advice from Bell, who encouraged her to join the Justice Department. 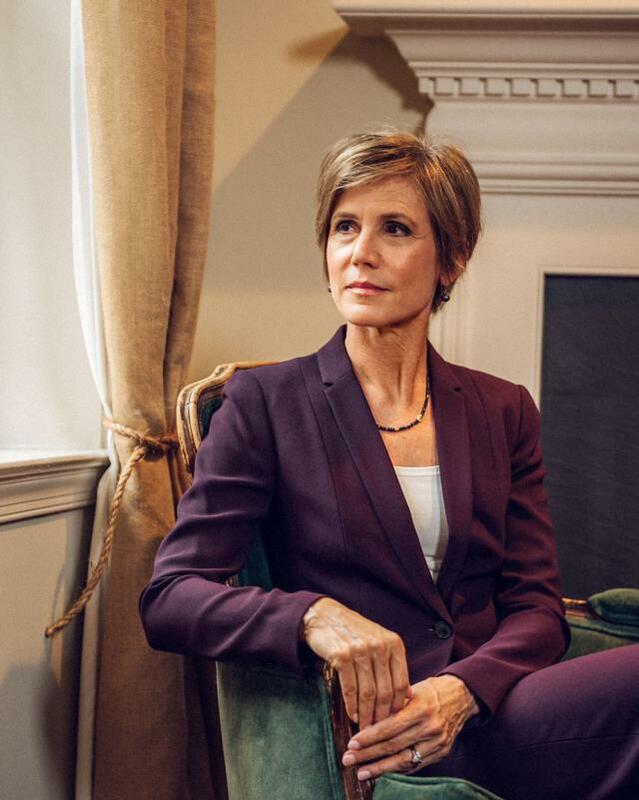 One of the Assistant Attorneys in the office cautioned Yates against taking the job, telling her that, coming from a silk-stocking firm, she might not be ready to deal with criminals. But Yates went on to prosecute a series of high-profile cases. One, in 1994, implicated some of Atlanta’s most prominent officials, including Ira Jackson, its first black city councilman, in a corruption scheme at Hartsfield International Airport. Douglas A. Blackmon, who covered the case for the Atlanta Journal-Constitution and has known Yates for decades, recalled, “She was facing off in this gigantic corruption trial not just against the city’s most powerful figures but against a dream team of the highest-paid criminal-defense attorneys in Atlanta.” Yates won the case, sending Jackson to prison, along with the brother-in-law of a federal judge. “That was awkward,” she told me. The judge was a close friend. Perhaps her most famous case was against Eric Rudolph. He was charged with bombing the Atlanta Olympics in 1996, a lesbian bar in Atlanta in 1997, and two abortion clinics in 1997 and 1998, killing three people. Rudolph’s bombs were “grisly, ugly things,” Yates recalled, with “two-inch nails laid head to toe that are circling all the pipes.” He was finally apprehended in 2003, when a police officer found him eating from a dumpster in a small town in North Carolina. Rudolph had stolen a large cache of dynamite, which he used to detonate the bombs, and much of it remained missing. One day, Yates received a call from Paul Kish, an attorney for Rudolph. As Yates recalled, “Paul told me, ‘He’s got about two hundred and fifty pounds of dynamite that is buried in a national forest, but it’s not very far beneath the surface.’ ” The forest was popular with Scout troops, and if a camper pounded a tent stake into the dynamite it could detonate. Kish said that Rudolph had agreed to tell Yates where the dynamite was if she took the death penalty off the table. “We’re thinking, What do we do here?” Yates said. “If you’re going to have a death-penalty case, this is a death-penalty case. But, on the other hand, are we going to put people’s lives at risk?” She decided to make the deal. Alberto Gonzales, who was George W. Bush’s Attorney General at the time, approved her decision. Rudolph gave directions over the phone to Kish, who gave them to Yates. She then relayed the information to federal agents, who went into the forest. “The agents were very leery,” Yates said. “They thought, We may very well be being sent out to this place where his real goal is not for us to find his dynamite but to kill us.” The agents found the dynamite and safely detonated it, leaving behind enormous craters. Rudolph pleaded guilty and was sentenced to life in prison. In 2009, the Obama White House wanted to nominate Yates to be the U.S. Attorney for the Northern District of Georgia. Her record of prosecuting local Democrats presented a problem, however. Representative John Lewis, the celebrated civil-rights leader and Georgia Democrat, told me, “The four African-American members, and three of the members in particular, that made up the delegation at the time had raised some concerns, and part of it had to do with her prosecution of the former mayor of the city of Atlanta, Bill Campbell.” Yates said that she heard about these concerns, and, after running into Lewis on a flight, she asked him for a meeting. Afterward, Lewis said, “I threw all of my support behind her.” The Senate voted unanimously for her confirmation. As a U.S. Attorney, Yates pursued several significant white-collar criminal cases, among them a Ponzi scheme in which some hundred and fifty people were defrauded of more than twelve million dollars; Allergan’s fraudulent promotion of Botox as a treatment for headache, pain, and juvenile cerebral palsy; and an international hacking ring that stole nine million dollars from more than two thousand A.T.M.s in less than twelve hours. The vote on Yates was 84–12. One of the “No” votes was from Sessions, whom Trump chose to lead his Justice Department. During Obama’s final two years in office, he intended to work through an enormous backlog of commutation requests, and Yates was his primary contact. Valerie Jarrett, Obama’s senior adviser, told me, “He looked to Sally to do that last review before the recommendations were sent over to the White House counsel.” Yates spent hours on the phone with Obama, who eventually commuted more than a thousand sentences. This January, before Trump was inaugurated, the incoming and outgoing leaders of departments held a four-hour exercise in emergency planning on the White House grounds. Lynch was out of town, so Yates represented the department, sitting next to Sessions as they role-played responses to events such as a terrorist attack or an Ebola outbreak. Sessions made it clear that Trump wanted Yates to stay on as acting Attorney General. “I expected this to be an uneventful few weeks,” she told me. In most cases, Yates said, “you try to find a way of balancing it, of figuring out timing and how you do a notification.” With Flynn, the balance shifted after he lied to White House officials and they repeated those claims. On January 15th, Vice-President Mike Pence said in an interview with CBS that Flynn and Kislyak hadn’t discussed sanctions. On January 23rd, Sean Spicer gave a summary of Flynn and Kislyak’s conversation, and he, too, denied that there had been any discussion of sanctions. At this point, Flynn was in what Yates called a “compromise situation.” The Russians knew that he had lied, and he was vulnerable to blackmail. On January 24th, the Justice Department sent F.B.I. agents to interview Flynn. Yates was briefed about the session the next day. I asked her if the agents believed that Flynn had lied to them, which would be a federal offense. “I can’t answer that,” she told me. On Friday, McGahn invited Yates and the Justice Department official back to the White House. He asked how serious the potential violations were, and how likely it was that Flynn would be prosecuted. Yates recalled that she said, “That misses the point of why we’re telling you about all this.” She told me, “We had just gone and told them that the national-security adviser, of all people, was compromised with the Russians, and that their Vice-President and others had been lying to the American people about it.” McGahn asked whether taking action against Flynn would interfere with the F.B.I.’s investigation. “You should not worry about that,” Yates said. “It’s not going to impact the investigation. Flynn has already been interviewed. We’re telling you this so you can act.” Finally, McGahn asked that the F.B.I. make the evidence against Flynn available to him. Yates told McGahn that she would have the Flynn materials for him by Monday morning. She left the White House, stopped at the Justice Department to pick up some documents, and continued on to the airport. She was returning to Atlanta for a dinner honoring a camp for children with serious illnesses and disabilities, which her husband has supported for years. On the way to the airport, she received a call from her deputy, Matt Axelrod. “You’re not going to believe this, but I just read online that the President has executed this travel ban,” he said. It was the first Yates had heard of the order. “I had been sitting in Don McGahn’s office an hour before that,” she said. “He didn’t tell me.” She later learned that lawyers in the Office of Legal Counsel, at the Justice Department, had reviewed the order, and that they had been instructed not to share it with her. A source familiar with the process said that even the most senior Trump aide assigned to Yates’s office didn’t know about the order until he saw the news on CNN. Yates found the order online and read it on her iPad. At the dinner, she spent much of the evening on her phone at the back of the ballroom. Over the weekend, several individuals challenged the executive order in federal court. Yates read through the briefs, and thought that two arguments against the order were particularly strong. Because it appeared to be based on the Muslim ban that Trump had proposed during the campaign, and because it gave preferential treatment to Syrian Christians, it arguably violated the Establishment Clause of the First Amendment. And, because the ban denied entry both to visa holders and to legal residents, there seemed to be serious due-process questions. From Atlanta, Yates instructed Justice lawyers to address any procedural issues, but to refrain from taking any position on the constitutionality of the order. Yates recalled saying, “I’m troubled about this from a constitutional standpoint—really troubled about this—but I want to hear, O.K., here are the challenges, but what’s the defense to this?” She wasn’t impressed by the argument, made by some officials, that the order had nothing to do with religion. After the meeting, she asked Trump’s most senior appointee in the office to stay, and told him that she remained concerned, and wasn’t sure what she would do. The statement was sent to thousands of department employees around the country. About four hours later, at around 9 P.M., McGahn’s office asked the senior Trump appointee to deliver a letter to Yates, notifying her that she had been fired. He said a prayer, and walked down the hall. “Madam Attorney General, I have a memorandum for you from the White House that I’ve been asked to deliver,” he said. Yates gathered up some of her things, and her security detail dropped her off at her apartment. The objects she’d left behind—files, plaques, photos—were cleared out, so that her replacement, Dana Boente, who was then the acting Deputy Attorney General, could start right away. When I sat down with Yates, it was the day after Trump fired James Comey. As with Yates’s dismissal, Comey’s raised questions about whether the President was trying to obstruct the F.B.I.’s investigation. The next day, the Times reported that, hours after Yates’s second meeting with McGahn, Trump had dinner with Comey and asked the F.B.I. director to pledge his loyalty to him. Comey refused. Last week, it emerged that Trump had subsequently asked Comey to end the F.B.I.’s investigation of Flynn. Rod Rosenstein, the Deputy Attorney General, appointed Robert Mueller, the former F.B.I. director, as a special counsel to oversee the investigation. Yates has been following these developments from Georgia, where Democrats have been trying to recruit her to run for governor in 2018. Yates told me, “I am totally ruling out the governor’s race.” But she also said that she wants to find another role in public life. “I recognize that I may have a voice that I didn’t have before, and part of what I want to be able to do is to figure out how I can responsibly use that voice in a way to impact things that I think really matter,” she said.